Keep it human: that was a key part of my presentation to last Thursday’s PR Week Crisis Communications conference in London. Remember the human side to a crisis – whether it’s a tragedy in which people have died, a health issue or a problem with a product that millions of people have bought. Use language that your audiences – customers, employees, for example – understand and appreciate. Taking responsibility is hugely important. At the outset, you need to make lightning fast decisions about the crisis and your level of responsibility. You need to be calm and dispassionate – but consider the situation from the outsider’s view. By contrast, British Midland famously took responsibility immediately after the 1989 Kegworth M1 air crash, with Sir Michael Bishop talking to the media on the scene. Virgin Trains took a similar approach with the 2007 Grayrigg accident. Social media and 24 hour news brutally punish corporate indifference in a crisis. It’s hard enough at the best of times to achieve clear and consistent communication within a large organisation. It’s even tougher, yet more important, in a crisis. It got worse. It turned out that Costa had an automated feed to feed offers and the like to its social channels. In the heat of the moment, no one remembered to turn it off. This is the incident that made Twitter famous as the source of breaking news. 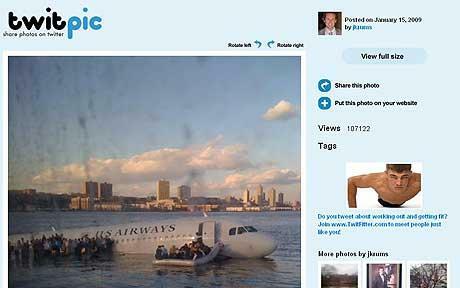 This photo was tweeted 10 minutes after the plane’s captain landed in New York’s Hudson river. It illustrates how quickly news spreads in a world where anyone can break news, not just media organisations. I agreed with the opening speaker, former HSBC colleague Pierre Goad, that social hasn’t reinvented the idea of a crisis. I liked Pierre’s view that contagion is a key feature of a crisis: news spreading like wildfire. That concept was as true 30 years ago as today. The difference now is that it’s easier for people to challenge the official view of a crisis – the facts, the explanation, the implications – through Twitter and other channels. It’s also even more important for organisations to adapt to this need so they can respond quickly to events. This is an extension of one of the oldest rules in crisis management: make friends before you need them. One of BP’s weaknesses in the Deepwater Horizon disaster was that it had not used social media to any degree before the crisis struck. This made it hard for the company to use social to engage with people, counter criticism and get its message across. It also gave an opportunity to the witty Twitter page set up under the name of BP Global PR. It had no connection with BP, but many of the tweets struck a clumsy note that some may have thought the authentic voice of an arrogant multi-national: “Please do NOT take or clean any oil you find on the beach. That is the property of British Petroleum and we WILL sue you”. Responding to a crisis doesn’t mean surrender. You should pragmatically and honestly assess the situation. Say sorry and accept fault gracefully when it’s right. But stand firm if it seems appropriate to you – and far more importantly to the outside world. Our PR agency Edelman did just that a few years ago when its offices were invaded by a naked climate change protest. The bare protesters chose Edelman because it was working for an energy company. The PR company tried to engage the protesters in a debate, but they refused. As a result, Edelman stood firm and explained that it tried to turn the stunt into a debate but had been rebuffed. Crises can be a shattering experience for anyone involved. They leave scars. I’ve mentioned the BP Gulf disaster a few times. BP would never win any prizes for how it handled the crisis. But anyone who calmly dissects BP’s PR failings needs to acknowledge the extraordinary challenge BP faced – regardless of its pratfalls. For months, a quarter of US media coverage was about Deepwater Horizon. That’s a higher proportion than 9/11. That kind of crisis would have overwhelmed most people, no matter how skilled. No wonder BP’s people were feeling battered. This entry was posted in Business, Media, PR and tagged BP, Business, Crisis Communications, PR, PR Week by Rob Skinner. Bookmark the permalink.